(UN News Wire) – The flag at United Nations Headquarters in New York is flying at half-mast this Saturday as the Organization marks the death of former Secretary-General Kofi Annan. Officials from across the UN system have been paying tribute to the man who led the global body for a decade, starting in January 1997. He was Secretary-General during what has been described as one of the darkest days in the Organization’s history: the 19 August 2003 bombing of the UN premises in Baghdad, Iraq. For Zeid Ra’ad Al Hussein, the outgoing UN High Commissioner for Human Rights, Mr. Annan is simply “irreplaceable”. “Kofi was humanity’s best example, the epitome, of human decency and grace. In a world now filled with leaders who are anything but that, our loss, the world’s loss becomes even more painful,” Zeid said in a statement. 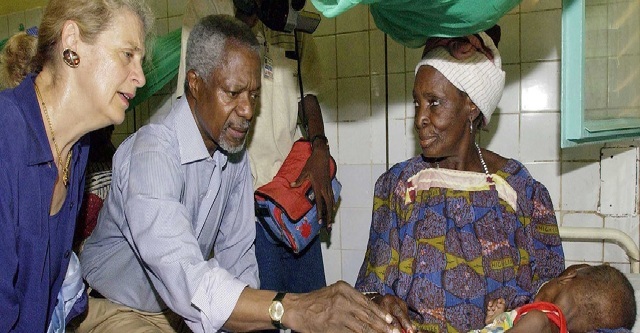 Mr. Annan was the seventh of nine men appointed Secretary-General since the UN was established in 1945. He was the first to emerge from the ranks of UN staff and the second to come from the African continent. Before taking the reins of the organization, he held various senior level positions at Headquarters and in the field. At one point he was Zeid’s immediate boss. “Later, when I was an ambassador at the UN he inspired us, by being a dynamic and charismatic leader in his capacity as Secretary-General,” Zeid continued.